The bacterial outbreak at a Los Angeles hospital highlights shortcomings in the federal government’s efforts to avert the most lethal hospital infections, which are becoming increasingly impervious to treatment. Government efforts are hobbled, infection control experts say, by gaps in monitoring the prevalence of these germs both within hospitals and beyond. The continued overuse of antibiotics — due to over-prescription by doctors, patients’ insistence and the widespread use in animals and crops — has helped these bacteria evolve into more dangerous forms and flourish. 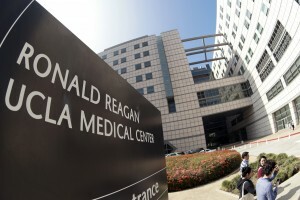 In the outbreak at UCLA’s Ronald Reagan Medical Center, two patients have died and more than 100 may have been exposed to CRE, an antibiotic-resistant bacteria commonly found in the digestive tract. When this germ reaches the bloodstream, fatality rates are 40 percent. The government estimates about 9,000 infections, leading to 600 deaths, are caused each year by CRE, which stands for carbapenem-resistant Enterobacteriaceae. UCLA Health says the infections probably were passed around by inadequately sterilized scopes used to peer inside a body. Previous CRE outbreaks have occurred elsewhere in the country, including hospitals in Illinois and Seattle. The immediate public health response has focused on the safety of the scopes and tracking down people who may have been exposed. The U.S. Food and Drug Administration Thursday issued a warning about the devices. But the California outbreak comes amid the government’s broader struggle to spot and battle the swelling ranks of bacteria that are resistant to most, if not all, antibiotics. CRE is one of three infectious agents that the Centers for Disease Control and Prevention categorized as the drug-resistant threats that require the most urgent monitoring and prevention. CRE is resistant to almost all antibiotics, including carbapenems, which doctors often deploy as a last resort. The remaining treatments are often toxic. A CDC report found that in the first six months of 2012, nearly 5 percent of hospitals reported at least one CRE infection. Unlike another urgent threat, Clostridium difficile, known as C. diff, the federal government does not publicly report CRE infection rates at each hospital. The federal government also does not monitor the prevalence of any of these antibiotic-resistant bacteria beyond health care facilities, although California, Georgia, Minnesota and seven other states do. “That is an example of a world-class infections system, but it’s only in 10 states,” said Dr. Trish Perl, a senior epidemiologist at the Johns Hopkins Health System in Baltimore, Md. People can often carry CRE in their gut without injury, but it can spread outside the gut quickly in people who are taking antibiotics for other ailments or in a weakened state. Lisa McGiffert, director of the Safe Patient Project at Consumers Union, said that the CDC recommends hospitals screen all new patients for CRE but “I find it highly unlikely that many hospitals are doing that.” She noted that UCLA this week notified patients who underwent procedures as long ago as October that they may have been infected. The federal government has been trying for years to get doctors and hospitals to shrink their use of antibiotics, since their proliferation has helped create these new resistant bacteria strains.The federal government has been trying for years to get doctors and hospitals to shrink their use of antibiotics, since their proliferation has helped create these new resistant bacteria strains. The CDC has encouraged hospitals to create antibiotic stewardship programs, in which experts systematically try to insure that the bacteria-fighting drugs are the best resource and that there is evidence that they actually work on the specific infection the patient has. For instance, stewardship programs can discourage doctors from bombarding patients with lots of different antibiotics. Instead, doctors can take an “antibiotic time out” until they get lab results and reconsider their approach. (UCLA Health has a stewardship program in place.) Last September, President Obama’s science advisers recommended that by 2017 all hospitals and nursing homes be required to have stewardship programs if they want Medicare payments. California last year mandated hospitals create stewardship programs, but the federal government considers them voluntary. Even the Infectious Diseases Society of America was unable to determine how many hospitals have such a program, said John Billington, the society’s director of health policy. The U.S. Centers for Medicare & Medicaid Services has been taking a tougher approach against hospital infections. Since October, more than 700 hospitals have been receiving lower payments from Medicare if they have higher rates of infections and other injuries. However, that program tracks only two kinds of catheter-related infections, not CRE. It will be another two years before the penalties incorporate rates from two antibiotic-resistant germs that have been around for longer than CRE: C. diff, and methicillin-resistant Staphylococcus aureus, known as MRSA.